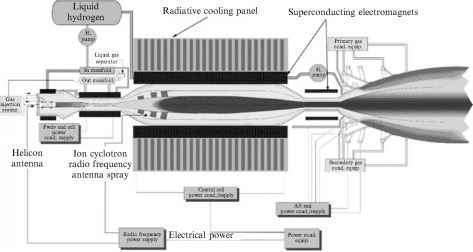 VASIMR is a high power, electrothermal plasma rocket concept currently under development at its NASA Johnson Space Center in Houston by a team headed by astronaut Dr Franklin Chang Diaz [Musser and Alpert, 2000; Chang Diaz, 2000]. VASIMR technology borrows heavily from US fusion R&D, and especially from the vast experience in plasma heating by radio-frequency electromagnetic waves, or RF heating for short. A recent survey of the status of VASIMR can be found in [Negrotti, 2008]. Although VASIMR can be classified as a MPD thruster, it possesses some unique features worth setting it apart from MPD propulsion. No claim is made by NASA as to the power source of VASIMR, but Isp and thrust imply power so large that a nuclear source appears to be the only practicable solution. 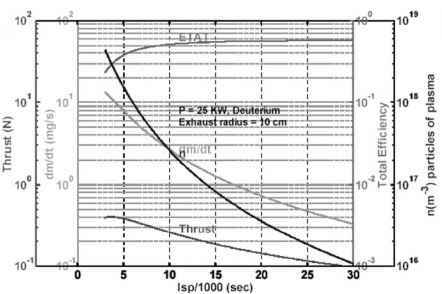 VASIMR is of great interest because it purposely meets the requirement of an ideal interplanetary propulsion system mentioned in Section 7.19, that is, higher thrust at low Isp or lower thrust and high Isp, so that the product of the two, the power, remains constant. Figure 7.32. 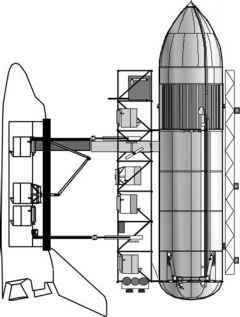 Schematic of variable specific impulse magnetoplasma rocket concept [NASA-JSC, 2000]. In its simplest scheme the VASIMR system consists of three major magnetic functional blocks, or cells, denoted as "forward", "central" and "aft"; this configuration is called by plasma physicists an asymmetric mirror (see also Chapter 8). The forward cell handles the injection of propellant and ionizes it, turning it into plasma; the central cell acts as an amplifier to further heat the plasma using electron cyclotron resonance (ECR) to the desired energy input for the magnetic nozzle. The third, aft end-cell, is a hybrid two-stage magnetic nozzle that converts the thermal energy of the plasma into kinetic energy of axially directed flow, while ensuring plasma is kept away from the nozzle walls by a magnetic field. Without the aft end-cell, the plasma flow would tend to follow the magnetic field "corkscrewing'' (spiraling) along the magnetic field lines, and the large tangential component of the plasma velocity would be wasted (only the axial component produces the momentum change we call thrust). With this configuration and strategy, the plasma is claimed to be controllable over a wide range of temperatures and densities. A schematic of the VASIMR system is reported in Figure 7.32. During VASIMR operation, neutral gas (typically hydrogen, but also deuterium) is injected at the forward end-cell and ionized. The plasma is radio-frequency (RF) heated within the central cell to the desired temperature and density. RF heating exploits ECR [Ilin et al., 2000; Takao et al., 2000]: electrons readily absorb the energy of radio waves tuned to the frequency of electrons spiraling around the magnetic force lines. The heated plasma is magnetically and gas-dynamically accelerated and exhausted from the aft end-cell. The key feature of VASIMR plasma rocket operation is its purported capability to vary, or "modulate", the plasma exhaust while maintaining constant power.